Dates: July 3 – August 31, 2017 in Fullerton & September 15 – October 15, 2017 in Anaheim. Description: The project chronicles the migration stories of migrants in the Orange County area. While primarily focusing on Latino history in and around Orange County, the project has collected hundreds of migration stories from individuals from all walks of life to demonstrate that migration is a universal part of the human condition. The exhibit is a collection of various media from artists throughout the country exploring the theme of migration through their own interpretation. Takes place at: Paulina June & George Pollak Library, California State University, Fullerton, 800 North State College Blvd., Fullerton CA 92834-4150 & The Anaheim Public Library (APL), 500 W. Broadway, Anaheim, CA 92805. 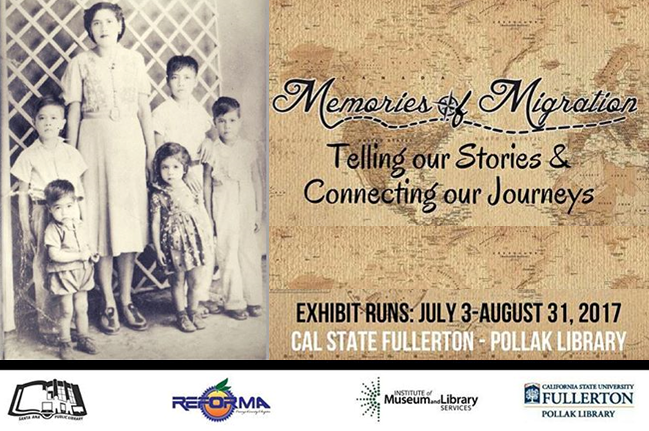 Friday, August 11, 2017, from 8:30am to 6pm: Cal State Fullerton – Pollak Library will held an all-day conference geared to librarians, historians, academics, students, artists and community members who would like to learn more about the migration stories of local and global people. The conference and art exhibit is open to the public.